Cauliflower might be a vegetable which has been eaten by Australians forever but, believe it or not, you ain’t seen nothing yet. From cauliflower pizza to cauliflower “potato” salad, the vegetable is in the spotlight not only for its health benefits but its ability to substitute for higher calorific or less nutritious foods. According to AusVeg, a representative body for vegetable growers in Australia, cauliflower production in Australia is growing. Between 2008 – 2009 production increased from 70,286 tonnes to 2008 – 2009 to 72,575 tonnes in 2013 – 2014. Gross value of the industry has also increased from AUD$49.76 million in 2008 – 2009 to AUD$55.46 million in 2013 – 2014. However, this is just the tip of the bunch to come. Although Australia currently has a solid supply of cauliflower, other countries are struggling to keep up with the new demand. At the end of 2015, the US experienced a cauliflower shortage due to its sudden popularity and supply difficulties from cold weather in some growing regions. A 2015 IndexBox Marketing and Consulting report has said Spain dominated global cauliflower and broccoli production exporting 54.9 per cent of its total cauliflower and broccoli production in 2013. The report says Spain, China, India and Mexico represented more than 82 per cent of global cauliflower and broccoli output in 2013. So why is cauliflower starting to take off in Australia? Cauliflower is rich in vitamins and minerals. One serving cauliflower contains 77 per cent of your daily Vitamin C needs. It is a source of fibre, vitamin K and choline (a vitamin that helps with brain development). Consumption of cauliflower has also been linked with improved blood pressure. If pizza, mashed potato and white rice are limited under a menu supplied by a dietitian, these options may however be put back on the menu with cauliflower. The vegetable is easily blended to be an alternative to rice, to make “flour” for a pizza base or to be made into a carbohydrate-free version of “mashed potato”. Amongst the dieters of the world, cauliflower allows them to eat guilt-free substitute. 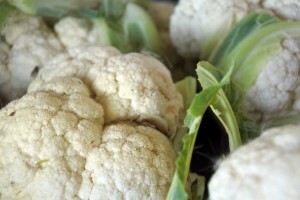 Cauliflower is also suitable for those who follow a paleo diet (a diet which avoids grains) as the substitute for grain. Cauliflower has been described by some chefs as a “blank slate”. It does not provide a strong flavour (some may even describe it as bland!). This however makes it perfect if cooks want to use it for things like pizza bases or “mashed potatoes”.